New York residents can now trade bitcoin on its Cash App. Shares of Square (NYSE:SQ) jumped 3% to an all-time high on June 18 after New York State's Department of Financial Services (NYDFS) granted the payments company a "BitLicense," which will let New York residents buy and sell Bitcoin via its Cash App. The NYDFS, which previously granted Square a money-transmitter license, reviewed Square's app and policies regarding money laundering, fraud, and cybersecurity before granting the license. The NYDFS has only granted the license to eight other companies in the past. Square started offering bitcoin purchases on the Cash App in January, but the NYDFS approval marks a major milestone: New York regulates cryptocurrency transactions much more tightly than other states. CEO Jack Dorsey is a big believer in bitcoin, which he recently claimed could become the internet's "native" currency. But will the company's move into the crypto market become an asset or liability? Last quarter, Square spent $33.9 million buying bitcoin but generated just $34.1 million in bitcoin sales. That equals bitcoin revenue of about $223,000, or less than 0.07% of its total adjusted revenue. Square's fiscal quarters are aligned with the calendar year. 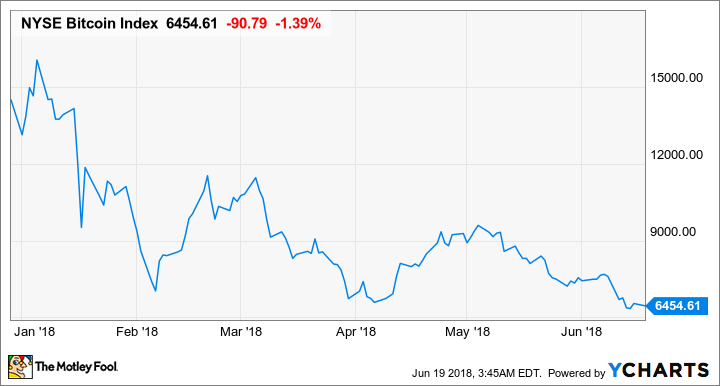 Square didn't disclose its average purchase price for bitcoin during the quarter, but prices were volatile during the first quarter. Prices continued to tumble in recent months, so investors shouldn't be surprised if Square reports a bitcoin loss for the current quarter. Square's bitcoin revenues, profits, and losses aren't significant yet, but two notes from last quarter's 10-Q filing stand out. First, Square states that its sales of bitcoin include a "small margin added to the price we pay to purchase bitcoin" -- indicating that Square could make money from each bitcoin transaction, but the margins would be slim. Second, Square notes that its adjusted revenue is "net of bitcoin costs", but warns that those costs could be "significant". This won't matter as long as Square spends a tiny sliver of its revenues on bitcoin, but wider disparities between its reported and adjusted revenues could emerge if Square gets aggressive with its bitcoin bets. Square also excludes transaction-based costs, its largest cost of revenue item, from its adjusted revenues. Bitcoin might seem like a side bet for Square, but the real aim is to widen Square Cash's moat against PayPal's (NASDAQ:PYPL) Venmo and Zelle, the new network backed by over 30 US banks, in the competitive peer-to-peer (P2P) mobile payments market. eMarketer recently reported that Square controlled 6.9% of that market last year, and that share should climb to 16.2% by 2022. However, the firm also expects Venmo's share to grow from 17.3% to 38.7%, while Zelle's share could surge from 15.8% to 56.1% thanks to the support of dozens of third-party websites and apps. Square's Cash app. Image source: Google Play. For now, Venmo and Zelle don't offer bitcoin transactions. PayPal CFO John Rainey recently told CNBC that if bitcoin "stabilizes in the future and is a better currency" then the company could "certainly support that." Meanwhile, Zelle is widely seen as a way for banks to counter the rise of bitcoin and other cryptocurrencies. Last month, Nomura Instinet analyst Dan Dolev suggested that Square Cash is actually growing faster than Venmo, and that its launch of a bitcoin platform could be a game changer. Dolev claims that with about 28 million cumulative downloads, Square Cash downloads are only about one million downloads behind Venmo. He claims that, historically, "Venmo saw more downloads versus Square, but the gap appears to have peaked in July 2017." Dolev attributes Cash's growth to the addition of bitcoin transactions, and notes that the app sports "more balanced growth" than Coinbase, a popular app for crypto transactions. eMarketer expects the total transaction volume across mobile P2P platforms in the US to rise from $167 billion this year to $300 billion by 2021. That leaves plenty of room for Square Cash, Venmo, Zelle, and other platforms to flourish. For now, investors shouldn't get distracted by Square's bitcoin efforts, since its core business still relies on the expansion of its ecosystem of next-gen POS (point of sale solutions), enterprise services, food delivery services, and financing. Wall Street expects those growth engines to boost Square's adjusted revenue and earnings by 47% and 70%, respectively, this year. But if bitcoin rebounds over the long term, we might see Cash gain a lot more users against Venmo and Zelle.